The science fiction play can be hard to portray on stage. There's usually something amiss in the execution. 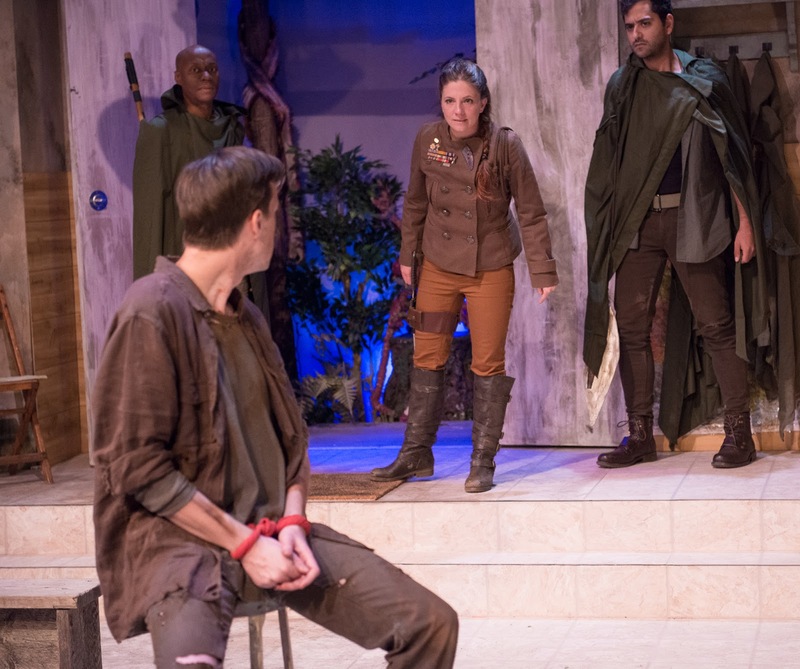 So how do you create a successful sci-fi play? Ask Mac Rogers. The Honeycomb Trilogy, comprising of Advance Man, Blast Radius, and Sovereign, surely have those fantastical elements but The Honeycomb Trilogy is science fiction masked as a family drama. And that's why it's so good. The Honeycomb Trilogy, as a whole, begins a few short years after the return of a manned mission to Mars. Upon their return, the astronauts, hailed as heroes, embark on a secret project. But what really happened on Mars and what is the correlation between the mission and the project? The Honeycomb Trilogy chronicles life on earth from the final days before an alien invasion, the dystopian aftermath, and the rebuilding after the Great War. Helmed by Jordana Williams, The Honeycomb Trilogy is a three set epic that transcends theatrical norms of the science fiction genre. What's interesting about Rogers' plays is when presented as one, they create a grand series with a clear beginning, middle, and end. Individually though, they could conceivably stand on their own. There certainly would need to be a great deal of explanation before seeing the second or third part but Rogers does a pretty solid job of recapping the events in a sufficient manner. What Rogers does well is craft a series that has a strong overall arc. There is a sense of purpose in each. The focal characters of the series are Ronnie and Abbie and Rogers takes good care of their stories. Like any piece of science fiction, the vernacular will always be closest to the author so finding a way to clarify the lingo and terminology for the audience would be of great aid. Even if it is in the form of a glossary. It took until the third play to finally grasp some of the terms. Accessibility is always crucial. What makes The Honeycomb Trilogy truly unique is the approach. The science fiction elements are present but at the heart of the story is one about family and love. And no matter who sits in the audience, those themes will resonate. But Rogers is like the "Lost" creators where he leaves many things unanswered like what happened to the astronauts by part 2! In Advance Man, we’re introduced to the Cook family in a time reminiscent of our own. But unlike the average American family, the Cooks have adopted an adult friend who is believed to be the victim of a stroke. The world that is projected is familiar and the characters and situations that Rogers brings forth are consequential. Bill convinces his son, Abbie, to draw a comic that he prescribes. As the play progresses, we learn that Bill, the patriarch of the family, has been hiding some secrets from his wife Amelia. When it’s revealed that the late nights are not the cause of an extramarital affair but in fact a science experiment as a result of an alien encounter on Mars, life, as the world knows it, is about to change as the comic characters are about to hatch on Earth. The tone of the piece is believed to be a kitchen sink drama but when it turns for the fantasy, that’s when Rogers comes to life. The dynamic between Bill and Amelia, the parents of Ronnie and Abbie, are the central focus of Advance Man. Sean Williams and Kristen Vaughan have an interesting rapport. The couple is supposed to feel distance between one another but there seems to be a lack of cohesion on the part of Williams. There is something lacking in the believability in his authority. When it comes to Vaughn, she shines bright like a star. The range of emotions Vaughn gives to Amelia is remarkable. The conflicts that the character is forced to face are difficult yet Vaughn offers humility. With The Honeycomb Trilogy living in three separate times, we’re introduced to characters who we’ll see abundantly, like Ronnie, Abbie, and Conor, and some that are present for the singular piece. With the astronauts being an important catalyst for the overall action, we get a glimpse of who these people are. Rebecca Comtois, Shaun Bennet Fauntleroy, and Carlos Martin play Bill’s fellow heroes Belinda, Valerie, and Raf respectively. Rogers gives us just enough background on each person but never really dives deep, especially with Raf. Raf is stunningly rich character that is damaged. Martin brings much intrigue that makes us want to know more about Raf and his actions of the past and present. When it came to Comtois and Fauntleroy, they didn’t exceed character but simply played the props that Bill created. Whether you know what’s to come, focusing in on the relationship between Abbie and Ronnie and Abbie and Conor is fascinating. What appears to be a one-off sibling bonding scene where the kids bond over a drawing of a bald woman on the porch will be a story that gets revived in each play. Rogers drops these little subtleties throughout that when they are picked up on make the trilogy thrive. Unfortunately for Becky Byers and David Rosenblatt, their youthful take on the characters doesn’t hold much impact. The bond between Abbie and Conor may be the most interesting in Advance Man. The love Abbie shows for Conor is heart wrenching. Jason Howard was the breakout actor in the Advance Man company. The way he transformed himself was effortless and authentic. My how things have changed! In Blast Radius, we jump ahead twelve years after the hatching of the honeycomb aliens. We saw that the hatching was caused by Abbie which has left he and his sister at odds. It’s revealed that Conor did not have a stroke and was the embodiment of the alien ambassador. With Conor’s aid, Abbie becomes sympathetic with the honeycomb who have now forced all humans into dystopian slavery. Unlike Advance Man, Blast Radius is full science fiction. There’s no teetering. The clarity of language is a bit rougher and harder to follow. The vocabulary that has since developed in the twelve years is foreign to the audience. Regardless, the life we had seen is no more and the way of the land has vastly changed. No longer are people identified by their full name, their last name is the house that they belong to. It’s a very “Hunger Games” type world that Rogers has set up. 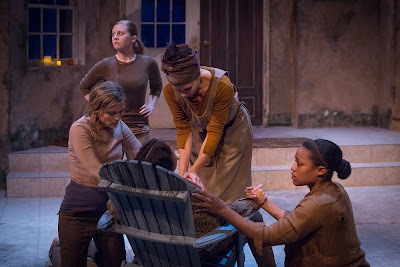 Using the same home from the previous play, now known as House 4, it is the place where pregnant woman stay to safely bear a child. Throughout this second play, we see Abbie and Ronnie at odds with Ronnie becoming a dominating personality with an idea of how to stop the alien command. This involves destroying the queen by implosion. Ronnie gathers 51 martyrs for the mission, including Conor, who has now adopted perfect English. What’s beautiful about this piece is Rogers’ incorporation of the themes and their parallels to society. They’re present and clear. This is truly the Abbie and Ronnie show. Byers and Rosenblatt are the focal characters in this part with their arcs dominating the story. Byers finds great strength in her sacrifice. 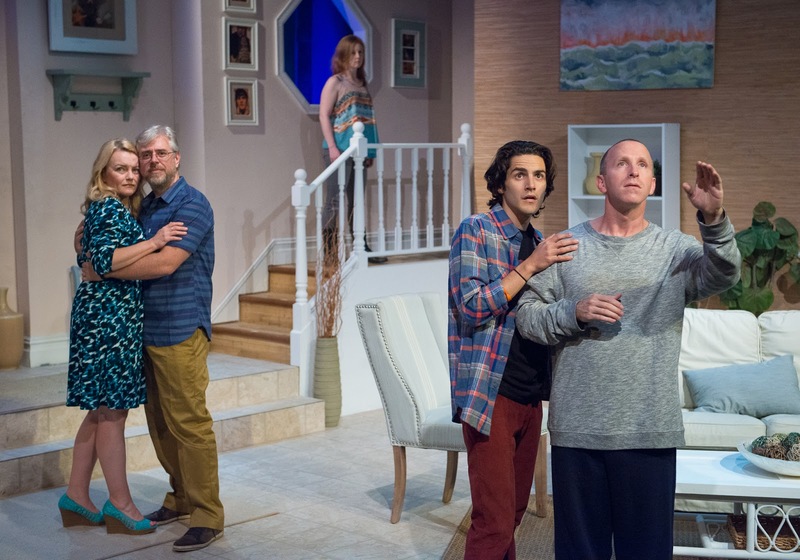 Rosenblatt seems lost in the science fiction world, bringing little energy to the stage. Kristen Vaughan returns as the aging mother. Though she has little to do in this piece, her impact is plentiful. Like Advance Man, Rogers introduces an array of supporting characters that are integral to the plot but do not get explored. Joseph Mathers as Jimmy serves as the cowboy comic relief, something desperately needed to lighten the mood. We meet Ronnie’s boytoy Peck, played by the dashing Adam Swiderski but like Gale in “The Hunger Games”, he’s only there to boost Ronnie’s story. Cotton Wright has the challenge that Jason Howard had in the previous play of creating a character that is an alien inside a human body. Unfortunately for Wright, Willa didn’t have the mesmerizing appeal that Conor had. With Amelia having a small role in this story, Nancy Sirianni takes over as the maternal figure. Sirianni does a stunning job transforming from leader to listener. When we get to Sovereign, the finale of The Honeycomb Trilogy, we learn that Ronnie’s mission was successful and the human race is once again the dominant race. The world is broken into sections with governors ruling. The governor of Coral is fear-mongering Ronnie. In this new world, the ideals of the past are tested where rules and laws are enforced. Though unlike past America, laws can be created to fit needs. And that’s the central plot of Sovereign, by far Rogers’ strongest of the trilogy. After Abbie is captured eight years after the honeycomb downfall, he is placed on trial under the proceedings of Governor Ronnie Cook. In order to ensure his execution, Ronnie implements a law stating the conspiracy or execution of mass exodus of a race is subject to death, something Abbie had conspired to do with the honeycomb to the humans. When all is about to go according to plan, the last remaining honeycomb queen is found on the governor’s doorstep causing Ronnie unable to kill it without breaking her own newfound law. The loose ends of the trilogy are tied neatly in this as the relationship of Abbie and Ronnie is completed faultlessly. We see the power struggle of humanity against family in both Cook siblings, drawing the rawness of the plot. Sovereign easily comprised the strongest overall cast. And that’s mainly due to the fresh faces as Abbie and Ronnie. Stephen Heskett as Abbie was transcendent. He was strong, observant, and impassioned in his fight to convince Ronnie to do what is right. Hanna Cheek’s Ronnie had true grit. Sitting on her thrown, Cheek exuded supremacy. Cheek had a growl in her voice that proved that her fight was well worth it. Compared to the duo that took on the Cook kids in the previous pieces, there’s no comparison the more appealing pair to watch. Sovereign introduces a duo of lawyers that are the perfect foils to one another Matt Golden as Zander and Lori E. Parquet as Tanya made the courtroom drama lively. The journey that the duo took to win was effortless. Their influence on Ronnie was almost as captivating than Abbie’s plea, which happened to be Rogers best writing. This was the perfect ending to the trilogy. Guiding The Honeycomb Trilogy required a vision from someone who not only could see the big picture, but project the universe. Thankfully Jordana Williams was the right person to steer the rocket. It’s inevitable with each piece running about two hours that the pacing would lag in spots, but Williams brought out the humanity of Rogers’ story. The overall execution from Williams and her entire design team is something to be applauded. Scenic designer Sandy Yaklin is the hero of The Honeycomb Trilogy. What Yaklin did from play to play to transform the set over time and rule was simply spellbinding. Advance Man featured a beautiful Floridian beach house with a pallet of white, sandy, and seafoam. It was inviting. By Blast Radius, the decay of the Cook home was in full view, with mold running ramped and the sense of desolation filling the space. By Sovereign, the Governor’s residence was filled with hopes of electricity and a dwarfing homage to the fallen 51. The details that Yaklin took in each, from the doors to the deterioration to the colors gave each piece the personality it desired. Costume designer Amanda Jenks did a wonderful job with the timeline of garments. Advance Man was an easy design but by the time she reached the last two, Jenks allowed each character to fit their wear. Though following the Hollywood rules of dystopian earth tone color pallet was a bit predictable. Sound Designer Jeanne Travis offered a soundscape that powered the plot. From the classic-inspired music to the tribal beats to the terrifying sounds of another life form, Travis gave the audio ambiance The Honeycomb Trilogy wanted. The biggest technical issue the trilogy encountered was the fight choreography by Adam Swiderski. While it easily could have been poor execution by the actors, the execution happened to be off on every single moment. But where Swiderski really raised eyebrows was the pregnancy battle between Ronnie and Willa. Sure, this is a future world, but the mobility these very pregnant women fought with was too comical. Becky Byers had some problems with her pregnancy maneuvering to begin with but when it came to the fight, Byers and Wright were leaping and running like a 5th grader in gym class. Energy is one thing but accuracy is another. The other bummer of the production, predominantly in Blast Radius was the lack of gore. Nothing takes an audience out of a tense moment then falseness. When Ronnie gives that final blow to Willa the moment is lost because nothing happens. The Honeycomb Trilogy is a daring and ambitious undertaking. But Gideon Productions should be extremely proud of their accomplishments. It’s by no means perfect but with the resources presented, it was a solid presentation. Mac Rogers has crafted something that transcends genres that needs to be put on film. The Honeycomb Trilogy could give some of those young adult series a serious run for their money.